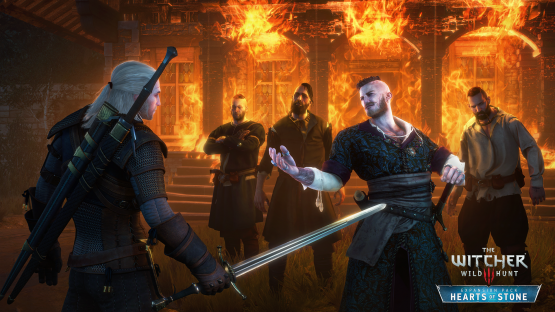 The Witcher 3 certainly wasn’t wanting for content. My original review of the game only had a couple of small gripes (which were largely rectified through later updates), and lacking content was definitely not one of those issues. And yet, I still found myself wanting more. Not because the game was lacking in any way, I simply was not ready to leave this world yet. Hearts of Stone is that “more” that I desired. More of Geralt’s steely voice. More points of interest. More gear upgrades. More Gwent. Oh yes, there’s more Gwent. Hearts of Stone is not only more Witcher 3 though. It takes your expectations of Geralt and the situations that he faces and twists them to provide a unique narrative that delves deeply into the world and the characters. The new characters introduced are captivating, such as the enigmatic Olgierd von Everec, who hides many secrets beneath his fiery mustached mug. Returning characters are given a chance to shine brighter, and depending on your choices in one scenario, you may learn a thing or two about Vesemir’s past as an active witcher. The world simply feels more alive with this expansion, if that’s possible in a game where everything already felt extraordinarily vibrant. The most interesting part of Hearts of Stone’s narrative, however, is the subtle way that it forces Geralt to make decisions and do things that fall outside of his comfort zone. 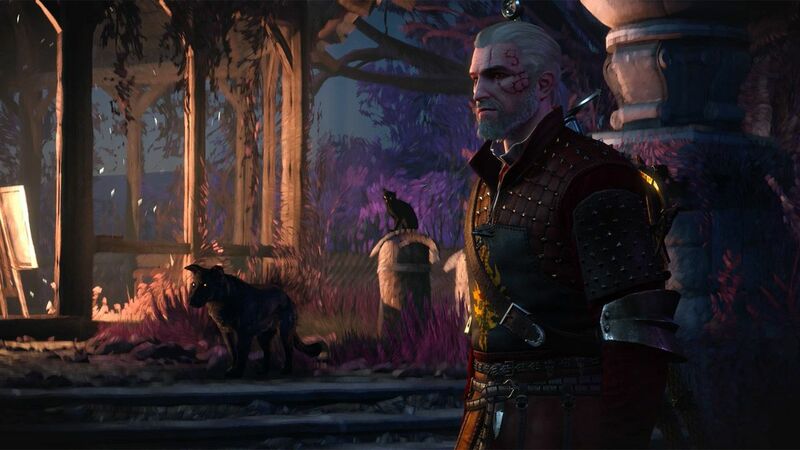 What begins as a seemingly simple and familiar contract against a monster sets Geralt on a path that will have him dancing at a wedding, making quick decisions in a heist, and entering another world to find the root of a nightmare. Each new situation offers pleasant surprises and humanizes Geralt beyond the narrative of the main game. 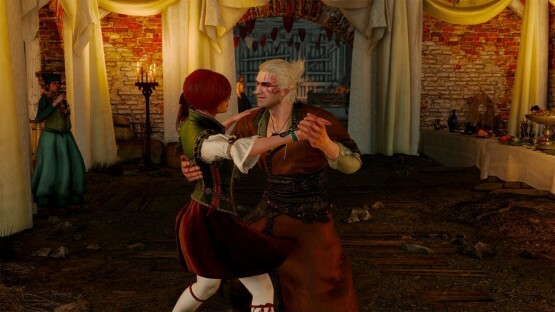 One of these such events is a wedding that Geralt goes to as the date of a certain Shani from earlier Witcher games. Through a series of events, Geralt has to go while possessed by a ghost — not just any ghost though. This one happens to like to take part in inordinate amounts of merriment, often leading to some very aggressive flirting and pickup lines that would probably make your mother blush. Ever wonder what it would be like if a non-witcher had to undertake a (relatively small) witcher contract? How about Geralt wrangling pigs into pens? You’ll get to see those things and more. And all the while Geralt is trapped inside of his own body without any control over his words or actions. I don’t want to give too much more away as the story is brilliant and kept me surprised with its constant shifting and breaking of traditional expectations. All of these elements aren’t shown in a quick presentation either. There are many full games that have campaigns shorter than the lengthy ten or more hours that it will take to go through Hearts of Stone. Divided into a few distinct acts that each feel like they could have been an expansion on their own, CD Projekt RED is setting a new bar for expanding game content, and the story isn’t all that this massive expansion has going for it, even if it does contain Geralt’s possession by the ghost of a philandering nobleman, an actual frog prince, and a stunningly unique painted environment that it is as beautiful as it is nightmarish. Hearts of Stone doesn’t stop at giving players over ten hours of new story. While there is no completely new area of the world map added, it populates the previously sparsely used North East section of Novigrad, doing so in such an organic way that it feels less like an add-on, and more like points of interest completely overlooked in the main game. New Gwent opponents? Check. Another horse race for even better horse gear? That’s here too. Manors, ruins, monster nests, and more? Yup, you can count on it. In a way, it would be easy to lament the lack of a whole new area, but the evolution of the existing environments makes the expansion feel more cohesive with the main game, rather than existing as a wholly separate entity. The organic additions don’t just apply to the environment. New gear has been added for players to pursue, and the addition of runewords gives further use to using runes in weapons and armor. Runewords are essentially three-rune combinations that can have specific effects like using adrenaline points to increase vitality regeneration, or imbuing your sword with the power of the signs that you cast. It’s a very small addition that I wish would have been more poignant in affecting how the game was played. The investment to get runewords started didn’t come across as worthwhile once you get the runewords equipped, particularly at lower tiers. By taking Geralt out of his element and changing the course of what we’d expect from a stoic witcher, Hearts of Stone is a must own for anyone that’s been hanging on to The Witcher 3. The story alone is enough to warrant jumping back in, but the way it integrates into the existing game just expands the already massive scope of the world. It’s not perfect, and there are a few missteps in execution — most notably in the lackluster addition of runewords — but it more than makes up for its faults in the things that it does well. It leaves me feeling very excited for the next expansion, Blood and Wine, which is reportedly double in size. Hearts of Stone review code provided by publisher. Reviewed on PlayStation 4. For more information on scoring, please read our Review Policy here.